You’ll never hear Yousif Al Dulaimi complain. Not about his 45-minute one-way commute from his home in Chandler to the campus of Grand Canyon University, not about the two jobs into which he pours 36 hours a week to support his family, not about the five challenging classes he’s taking this semester for his biology major despite having learned English just two years ago. GCU freshman Yousif Al Dulaimi and his family are Iraqi refugees who fled their homeland in 2013. Now, he’s studying biology, working on campus and living his dream. You’ll never hear this GCU freshman, who turned 18 Wednesday, complain because he’s living the American dream, albeit for now, as an Iraqi refugee. It’s a remarkable attitude for a person who spent two-thirds of his young life surrounded by war. Yousif doesn’t remember much about life in Baghdad before the Iraq War because he was only 5 when U.S.-led forces invaded the country in March 2003. 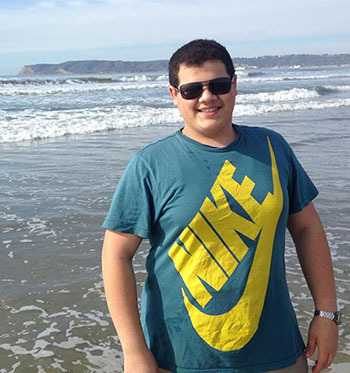 His father, Fawaz Aldulimi, managed duty-free shops at the Baghdad International Airport, and his mother, Hanan Al Chalabi, focused on raising their three children, including elder sister Rahiq, now 19, and younger brother Ali, now 14. Both parents knew the value of education and made sure their children did their homework and got to school and back home safely. But otherwise, the family didn’t go out much — Yousif never rode his bicycle in the neighborhood or played with his friends at a park — because it was simply too dangerous. Yousif was taught by his parents to watch what he said. Because his father worked for a company that dealt with American forces, Yousif said his father was targeted by the Islamic radicals. In 2013, the terrorists sent a message to the family — they beheaded their cats and left a warning note: Leave home immediately or be killed, he said. The family fled to Erbil, Kurdistan, in northern Iraq. Yousif was enrolled in a school for smart students because of his science acuity, and he learned Kurdish and English, too. The boy who loved science and technology witnessed widespread death and injury and vowed to become a surgeon. “I think it would be a great feeling to be able to help someone and help them return to their family, to be a person who would be able to heal,” Yousif said. But a career in medicine would not be possible for him in Iraq. Setting up a new life in the U.S.
Nearly a year after applying for tourist visas to come to America, Yousif and his family arrived in Chandler, where friends who also were Iraqi refugees had settled. It was June 28, 2014, and Yousif would start his senior year at Hamilton High just weeks later. Among the first people he visited was counselor Rosemary Gallo, who remembers he had many questions about the state’s high school graduation exam. “He wanted some study guides for the AIMS test — no student ever does that, and I thought, ‘Oh my goodness, you are quite a different soul,’” Gallo said. 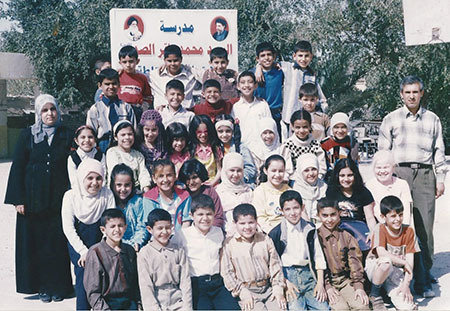 Yousif found Hamilton’s classrooms to be modern, with computers and projectors that were nonexistent in Baghdad, and its teaching methods foreign. He was accustomed to lectures and homework, not critical thinking and collaboration. 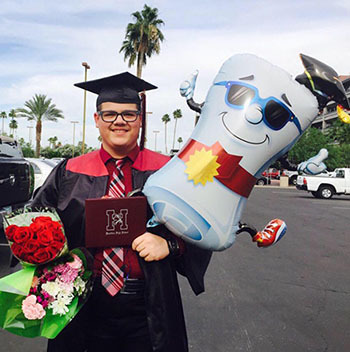 He had never heard of advanced placement classes, but he enrolled in AP biology at Hamilton and did well, graduating last spring with a 3.75 GPA. But socializing with other teenagers was difficult for him. Yousif graduated from Chandler’s Hamilton High last May with a 3.75 GPA. Yousif’s questions for Gallo, about graduation, college admissions and scholarships and whether his siblings could drop by for counseling, too, kept coming. In less than two weeks since school started, Yousif has jumped into his classes, 15 credit hours, with both feet. He especially enjoys chemistry, physics, biology and math and is learning Spanish because that’s what wise doctors do. Yousif works 20 hours a week on the ITS help desk and also is a clerk at Sprouts. He likes movies — especially Harry Potter for the magic and “The Fast and the Furious” for the action. The one thing he may have in common with American teenagers is that he likes hip-hop music. His father is looking for a job, but at this time Yousif and his sister are working to support their family, which is awaiting word on their asylum application. 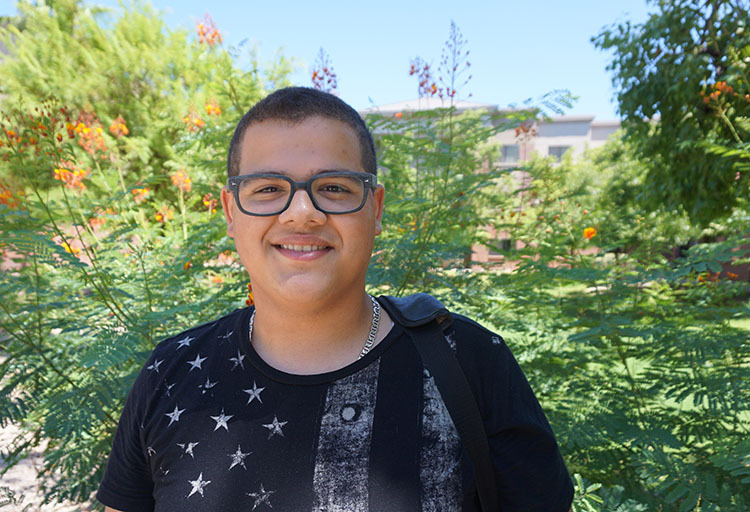 Yousif said he is blessed that GCU offered him a good scholarship to help make his dreams, which are as everyday as safely walking outdoors to as long term as earning a medical degree, a reality. You won’t hear Yousif chatter about his “fondest childhood memory,” a term he didn’t know the meaning of until it was explained to him. It’s simply living to see another day. His past will always be a part of him, Yousif said, pointing to his chest, but he chooses to move ahead. Contact Janie Magruder at (602) 638-8018 or janie.magruder@gcu.edu.